Job Title: Electrical Field Service Engineer Salary: £31,500k - £38,500k +pen +bonus +van +fuel +OT +health +expenses Location: London (field based) Opportunity Do you live close to the North / South circular road network? Would you like to work for a market leading German engineering company that designs and manufacturers its own industry leading kit? Do you live close to the North / South circular road network? We're looking for a customer focused electrically biased engineer who wants to join a company were you will be treated like a person and not just a number. The client are a unique German engineering company owned and run by its employees, similar to Waitrose or John Lewis. You'll be entrusted with clients ranging from luxury hotels to doctors surgeries and be seen as the face of a company you can feel proud to represent. If you're a fan of all things engineering and have the desire to work for a company that takes pride in providing industry leading training and development, this maybe an opportunity for you. If you have a background in electrical engineering, centered on commercial or industrial work, I'd like to hear from you. The nature of the role includes electrical maintenance, install and service to our clients own innovate product range. Being a German company quality is their main priority, with the plant out in Germany using some of the latest manufacturing techniques to build new and innovative machines, some with a value of up to £1.5m. In layman's terms what they make is an enhanced version of your family dishwasher, designed to wash and dry up to 40 items in under a minute on a commercial and industrial basis. This kind of kit will be used in airports or large retail units. then you should certainly apply. What does the word integrity mean to you? For our client it means that they have a commitment to you and to fulfil the promises they have made to over 43 engineers over the past 5 years during a sustained expansion period. The role is field based and you'll have a lot of opportunity to increase your earnings from your basic salary of £31,500 which doesn't include a non-targeted bonus of £2000 paid quarterly just to keep you motivated and feeling wanted by the company. Lee, Mike and Ian, the last 3 engineers who have served over 12 months have all experienced earnings above £38k including overtime. You also get BUPA healthcare, a 5% non-contributory pension and over £1000 in annual call out earnings. As you can see this opportunity comes with an outstanding basic salary and the opportunity to earn an extra £8k in overtime. 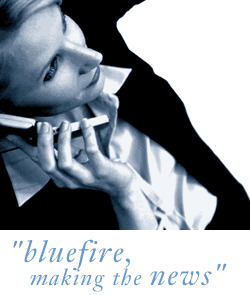 Bluefire offers a very generous reward scheme so if this role is not for you but you would like to recommend somebody else and they were to be successful in securing the role we would offer attractive referral fee. The last fee we paid out was £400.